Hey – anyone remember hearing about the Vegas shooter? A fact. As in not speculate, surmise, guess, or pull an assertion out of your… Why is this a fact? Seems to me everything is a fact when you’re in full TDS mode. No doubt a highly educated woman who is horrified that all those hicks in flyover land have a say in making public policy. How many examples of idiocy can you spot in the tweet? -The obvious one, that the Vegas shooter is dead and can’t be sent anywhere. -The notion that Guantamo would be appropriate for an American accused of committing crimes on American soil. -That a killer with no known motive is equvalent, in law enforcement, to a terrorist who has claimed allegiance to a terrorist army whose goal is to defeat the United States, and who claims his killing was driven that allegiance. Only a place like GWU and Thinkprogress would hire an idiot incapable of making simple logical distinctions. 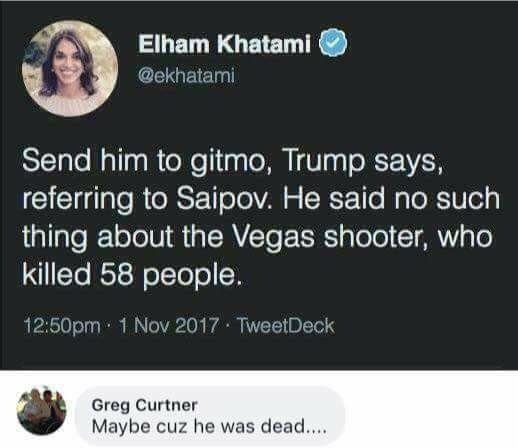 If the Mandalay Bay shooter were sent to Gitmo, the Democrats would finally have a clear example of outright cruelty to the living inmates there, no? Kinda like the 300 year sentences sometimes issued make me feel really sorry for the other guys in the cell block….a century from now. ThinkProgress has the dumbest *** professional *** hacks by far. It’s shocking in some ways. Ian Millhiser makes a spectacle of himself every other month, it seems. I have to speculate that when accepting a position with ThinkProgress, one must be required to leave your IQ at the door. Aaron Rupar, who used to write locally, (City Pages? ), used to be somewhat thoughtful, although often wrong. But now seems never thoughtful, just ideological. Rupar was a very good reporter, but being a hack is a better option these days for most people.